The Dunlap Broadside Prints are produced in two formats. Both formats measure 23" x 17 1/4" with an image 18" x 14 3/4". The First Edition of one thousand are hand serial numbered and recorded. 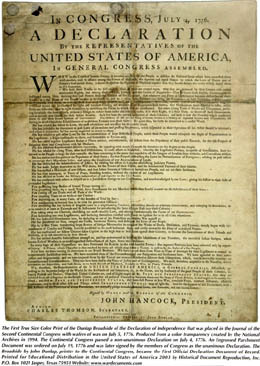 The First True Size Color Print of the Dunlap Broadside of the Declaration of Independence that was placed in the Journal of the Second Continental Congress with wafers of wax on July 5, 1776. Produced from a color transparency created by the National Archives in 1994. 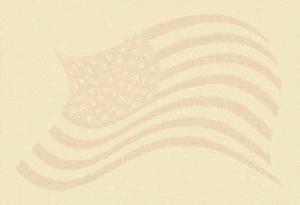 The Continental Congress passed a non-unanimous Declaration on July 4. 1776. An Engrossed Parchment Document was ordered on July 19, 1775 and was later signed by the members of Congress as the unanimous Declaration. The Broadside by John Dunlap, printer to the Continental Congress, became the First Official Declaration Document of Record.